The Westphal College of Media Arts & Design offers six graduate degree programs that prepare students to begin or enhance careers in design, media and non-profit arts sectors. Class sizes are kept small to allow the highest level of teacher-student interaction. The courses are hands-on and challenging. 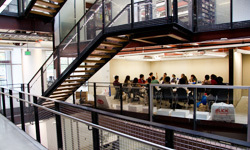 Graduate students have access to specialized facilities; design studios, computer labs, television studios, art galleries and the Fox Historic Costume Collection. Urban Strategy Andrew Zitcer Ph.D.